February 22, 2015. After a quick, two-hour nap, we met up with Marcus Åhlund, the owner of Arctic Fishing Adventures, for an all-night expedition chasing the Northern Lights. And I do mean chase. Unfortunately, the heavy snowfall that had hung around all day continued to plague us in the evening. Snow is pretty — until it keeps you from seeing something you’ve traveled almost 4,000 miles to witness. 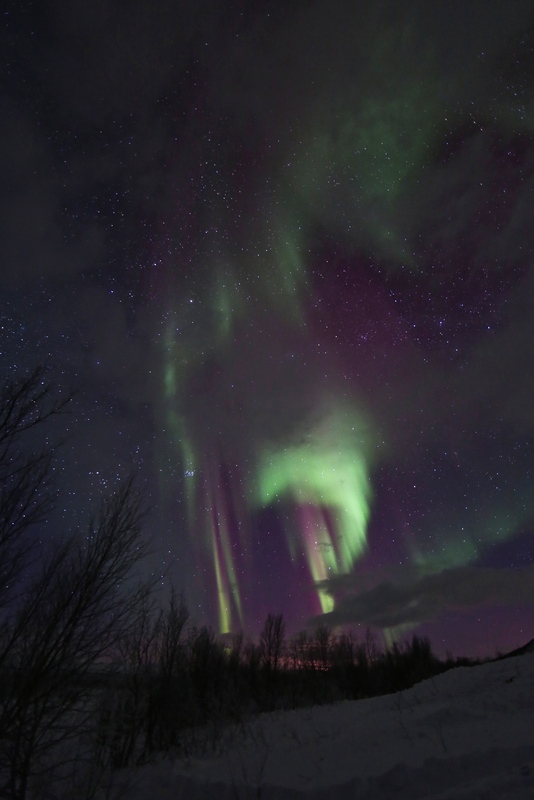 Galileo christened these the “borealis aurora” (North Dawn.) Today, we call lights in the northern hemisphere Aurora Borealis and lights in the southern hemisphere Aurora Australis. Marcus assured us that he would outrun the storm and bolstered our hopes by revealing that, according to the experts, this evening was predicted to be one of the most active nights for viewing that they’d seen in a long time. 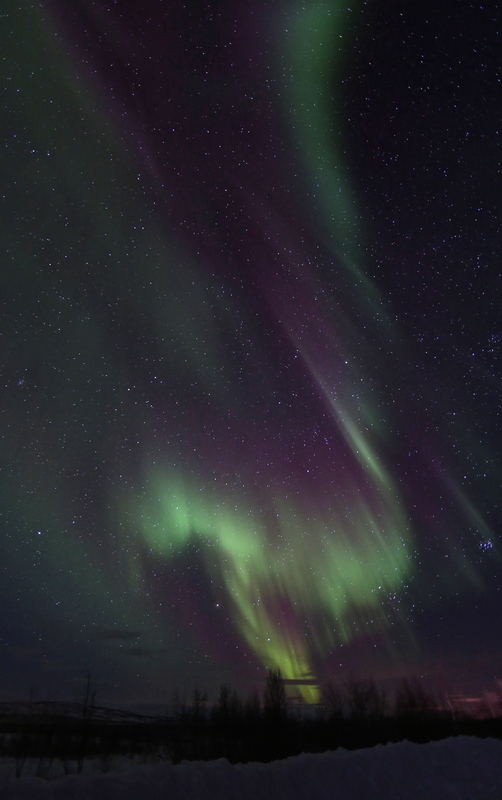 With that promise, our group of 12 boarded the van and settled down to watch a video on the history and science behind the Northern Lights as we headed east, away from the bad weather. Note the oxygen collisions are red at higher elevations and green at lower. As it turns out, the sun is the culprit. It regularly ejects charged particles that rain down upon the planet, rattle Earth’s magnetic shield, and get shunted towards the poles in the process. (By the way, the aurora activity is identical at both poles. Same time and date, same visual display.) When these excited little electrons and protons finally enter our atmosphere, they collide with other atoms in bright bursts of light. The color of the light is dependent upon which kind of atom each electrically-charged solar particle hits, and the altitude at which the collision occurs. “Accidents” with oxygen atoms cause red emissions at high altitudes and green at lower levels, while nitrogen “fender-benders” create bluish and purple light. More driving brought a few wildlife encounters. At one point, we stopped for a momentary glimpse of a moose before it high-tailed it into the forest. Our neighbor across the aisle then pulled out his phone and showed us a photo of the Arctic Fox he’d filmed the night before. “We got out of the car for a brief break, and it just came right up to me. Marcus said he’d never seen anything like it in all his years of taking folks on this tour.” The guy then flipped through his photos and showed amazing images from the previous evening’s hunt. Turns out, several folks had booked more than one night with Marcus, just to make sure they got a chance to see the Lights. The pinpoint shows where we finally set up camp on the border between Finland and Sweden. We didn’t have that luxury of time, so we crossed our fingers that we’d make it to a clear spot. “Don’t worry,” Marcus assured us. “The Lights typically aren’t visible until at least 10:00 p.m. this time of year, so we’ll be okay.” Another hour went by, and we entered Finland, passing the sleeping border-patrol officer. Still too many clouds. Our driver, Jonas, continued to zoom southeast down towards Sweden now. Fully equipped and instructed, we waddled out into the night. At first glance, I couldn’t see why we’d stopped. The only light visible seem to be the moon seeping out from behind a cloud. As time passed, it focused more into a patchy halo. Eventually it formed what appeared to be a white wisp stretching across the sky. “That’s it?,” I thought. “I’ve driven four hours for a band of fog?” But Marcus explained that this was just the beginning of the show, which wasn’t predicted to get really rolling until around 11:00 p.m.
At first, all we saw was a green glow behind the clouds. The orange light is the setting moon. Then a rather unimpressive “band” formation appeared. We all busied ourselves with setting up our cameras in a line, so as to avoid getting pictures of one another’s backsides silhouetted against the sky. Marcus helped us practice with our aperture and shutter speed until we all got satisfactory photos of the arc of light called a “bow formation.” To be honest, it looked much more spectacular on film than it did to the naked eye. But Marcus encouraged us not to lose hope. A snake slithers across the sky. You can see why superstitions and folklore surround the appearance of the Lights. Pretty ghostly, like writhing spirits. 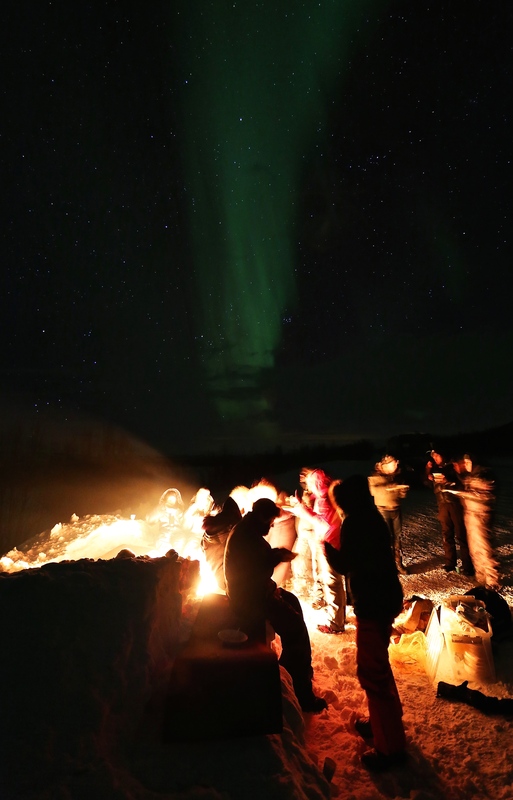 Our group gathers ’round the fire to sit on snow benches for coffee and fish stew. Shortly after, things quieted down again to dim patches of green haze, and we feared the show was over. Marcus took that moment to feed our hopes in a practical way — with fish stew. While we’d all been sky-gazing, he and Jonas had carved a square bench from the snowbank and had started a fire. Over the flames sat a tripod holding a large vat of the tastiest fish stew I’ve ever had. “My girlfriend makes it. She’s a chef,” Marcus explained. We all huddled round the fire and warmed ourselves with stew, coffee, and dessert, hoping that the Lights would soon reappear. To entertain us while we waited, Jonas asked if any of us would like to go snow-shoeing. Most everyone jumped at the chance, so he and Marcus unloaded poles and shoes from the back of the van and taught us how to strap them on. Matthew and I have our own snowshoes that we take out for a spin every time Chicago hosts a blizzard (which happens more frequently than you’d think), so we were familiar with the odd, slightly straddled gait that one must employ to get anywhere. Even knowing the ropes, we still found it a challenge to climb up a six-foot snowbank and reach the white field beyond. After we’d all “ascended the peak,” Jonas took us on a brief walk to help us get our snow-legs. “This is good snow,” he said. “I just finished my mandatory year-long stint in the Norwegian Army (service for men is mandatory, women’s service is voluntary), and sometimes they made us run in six feet of powder. It’s kind of ridiculous, because snowshoes don’t work in powder,” he said. “So what did you do?,” I asked. “We just floundered and flopped around until we exhausted ourselves, then the army was happy,” he joked. Next, Jonas organized a race. We all lined up and prepared for the cue. “If you run beyond the treeline and onto the frozen lake, you’ll be in Sweden,” he informed us. Right, like we’re that good. We all charged ahead, but within about four steps, my feet broke through the crust and I ended up hip-deep in snow. Everyone else fared similarly, thrashing and laughing as they dug their way back to the top of the layer and struggled to get their feet under them again. As we headed back towards camp, the lights suddenly made an encore performance. We’d thought we’d seen great stuff before, but this second act was stupendous. I’d been a little disappointed earlier that the lights didn’t “dance” like I’d imagined. Now, they shimmered and slithered across the sky, looking like rain descending from a storm cloud. It’s the oddest motion, almost like watching the fins of an electric eel. I could actually witness the waveform ripple from tip to tail — and I could even track the descent of individual little particles as they pinballed their way down through the sky. A ribbon silently ripples across the sky. Note the purple nitrogen collisions at the bottom of the band. A “drapery” shimmers and flutters as if it’s blowing in the breeze. You can actually see the particles rain down as a corona begins to form. Then the Lights began warping and writhing right over our heads, whipping themselves into the famous “corona” formation that few people get to see so clearly. Everyone starting screaming and practically crying, myself included. (I called my mom and left her what was probably an incoherent message describing the Aurora’s incredible antics.) Words just don’t do it justice, and neither do photos. I tried to video tape it, but Marcus explained that it would simply appear as a blur of white light on film. (He was right.) Most “videos” of the Aurora are actually time-lapsed photos stitched together via fades from one image to the next, almost like a slideshow. Looking into the heart of a corona. Standing directly beneath the Lights is what actually makes them appear as a corona. Perspective is everything. Not being able to capture the Lights fully made me really live in the moment and burn the memory into my brain. It was truly one of the most profound natural encounters I’ve ever been fortunate enough to experience. I only wish I had more ways to share it with friends and family, so that you all could live the magic, too. 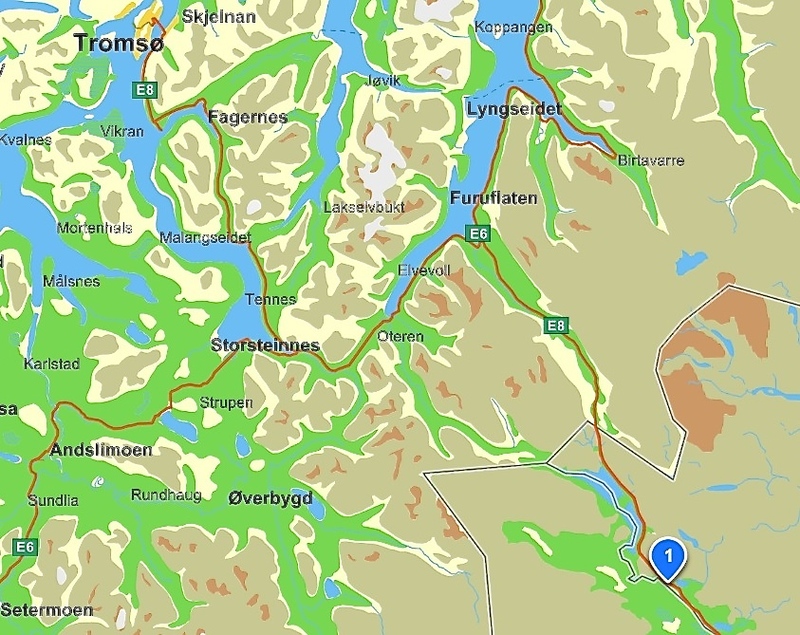 Just a reminder — if anyone wants to come for a visit, I’ll gladly take you on a trip to Tromsø. Just gear yourself up for the cold, because the lights are best visible between November and March. And speaking of cold, at this point we’d all spent about two hours in fairly frigid temperatures (-9°C/15°F), and as the lights were dimming again, Marcus suggested that we consider heading home for the night. Everyone agreed, and we climbed back into the van for the long, four-hour trip. We dozed on the way, and by about 4:30 a.m. we stumbled groggily back to our hotel room, where we slept until 10:00 a.m. The next morning, we perused our photos and were thrilled with the memories, but later, Marcus sent us the pics that he’d taken (including our portraits and the seven images immediately above). As you can see, his shots were absolutely unbelievable — just shows what a professional can accomplish! On that note, I want to thank Marcus and Jonas for providing us with such a phenomenal opportunity. No two people could have worked harder to ensure we had a fabulous time. You guys helped us grab life with both hands and wring out every possible experience from the night — you’re the best! I would love to see the northern lights. Thank you for sharing your experience! Apparently, the northern lights are picking up this month. They will be seen farther south than normal, there are even supposed to be visible in MI and WI this week.